Lately I’ve been working long hours and sleeping very little. I’m physically and mentally drained. I’m looking forward to a relaxing Easter weekend. My wife, 4-year-old son and I will spend the holiday at my parents’ house in Sacramento. I’m planning on making this weekend a mini-vacation for myself. But before the relaxation can begin, I’ve got to spend some serious overtime hours on Good Friday to finish up a bunch of work-related tasks. I’ll complete my work before the sun comes up Saturday morning, then I’ll sleep maybe two or three hours, pack up my family around 5 a.m., and we’ll hit the road. The drive shouldn’t be too bad, even though I hate driving because I drive so much throughout the year. But I’ll be looking forward to a relaxing Easter weekend, so I should be able to persevere through the five-hour drive. We should arrive at my parents’ house before noon. We’ll say hello, then jump back in the car and head on over to a Kiwanis Easter egg hunt about 30 minutes away. My step-dad, who is president of his local Kiwanis club, is very excited to have his grandson attending the event. All the members have heard so much about my son. They can’t wait to meet him. So I’ll have to be sure to get up north in time to make the Easter egg hunt or my step-dad will be very disappointed. The pressure is on because predicting the arrival time of a lengthy trip with a 4-year-old is extremely difficult since, as most parents know, 4-year-olds constantly have to go potty. 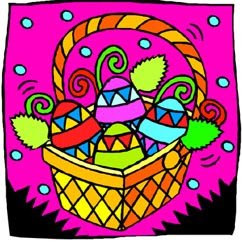 After the Easter egg hunt, assuming we make it up north on time, we’ll jump in the car again and head back to my parents’ house to dye our own Easter eggs and work on some Easter crafts my mom has set aside for the family. And even though I’d rather be relaxing Saturday afternoon, I have to do the traditional Easter crafts. It wouldn’t be Easter without those crafts. But I’m getting ahead of myself. Let me get back to my relaxing Easter weekend. After Easter dinner on Saturday, I’ll go to sleep. But not for too long, since we’ll have to get up early, jump back in the car for a 30-minute trek to my sister’s hometown for Easter mass and Easter brunch at her house. After Easter brunch, my sister will host the family Easter egg hunt. And even though I’d rather be relaxing, I have to participate in the family Easter egg hunt. It’s a tradition. And it wouldn’t be Easter without the family Easter egg hunt. Following the hunt, it’ll be time to jump back in the car for a little five-hour drive back down Interstate 5 to my home, where I’ll gladly say hello to the pillow on my bed. A few hours later, I’ll wake up for another grueling day of work. Sure, my plans for this Easter weekend might seem a little hectic, but aside from the lack of sleep, the rushing around, the pressure of making it to my parents’ house in time for the Kiwanis Easter egg hunt on Saturday, driving more than 12 hours in two days in holiday traffic, nonstop activities all weekend and the anticipation of massive work early Monday morning, it should be a relaxing Easter weekend. I guess I can always plan to take that mini-vacation I need on the Fourth of July. Though my wife tells me that her family, which I’m told includes our family, is planning a trip to her aunt’s house in the Bay area for the Fourth. And even though I’d rather be relaxing on the Fourth of July . . . maybe I’ll run away.